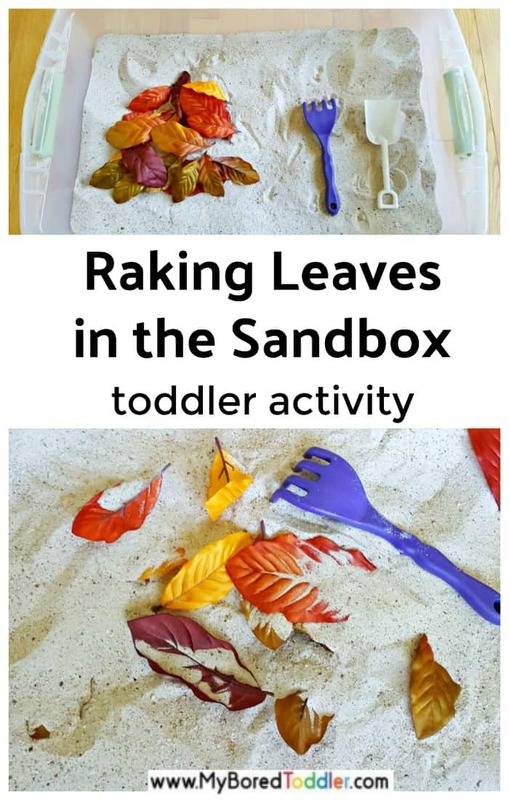 Raking leaves in the sand box is such an easy activity! 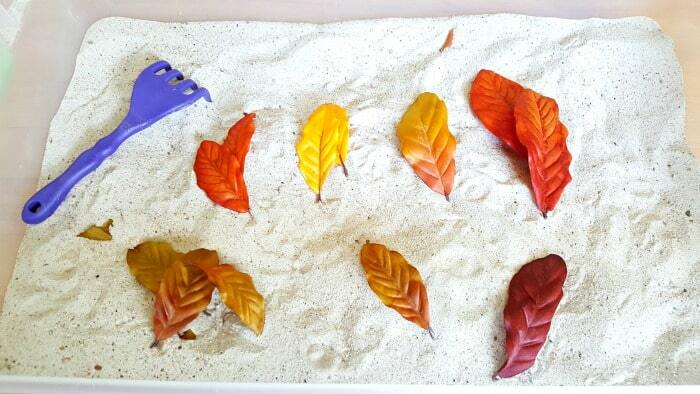 Colored leaves and sandbox tools combine for some awesome Autumn / Fall sensory play for toddlers. 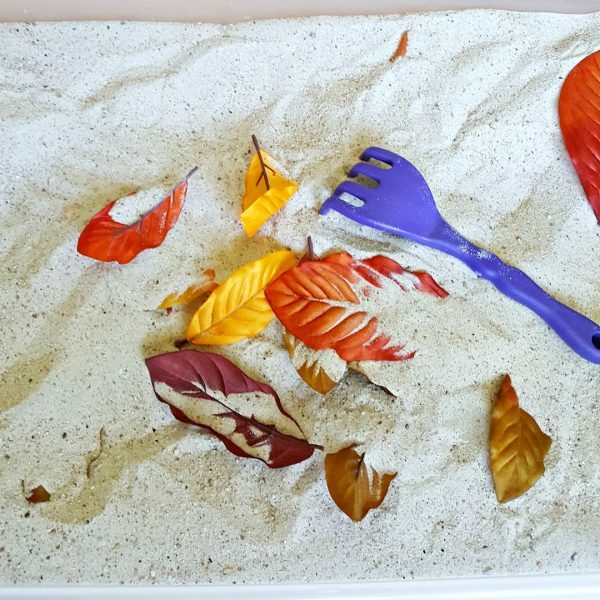 Welcome the fall season into the sandbox with this simple raking autumn leaves activity. 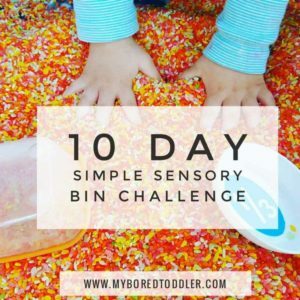 Such a simple fall Toddler sensory bin that’s quick and easy to set up too! The sandbox is a fun place for sensory play for toddlers. The textures and colors of the sand, the variety of toys and digging tools, all provide interesting play options. 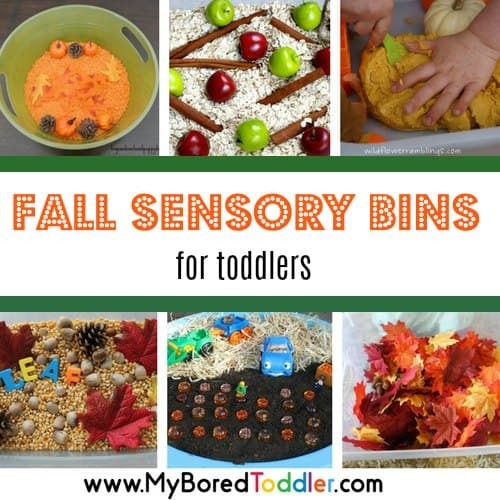 The fall season offers even more opportunity to experiment with colors and textures by adding leaves, acorns and other seasonal items to the sensory bin. 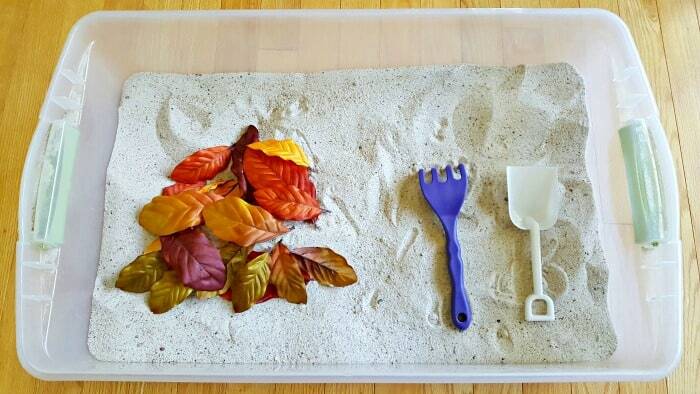 Create an amazing invitation to play with this simple sandbox activity. 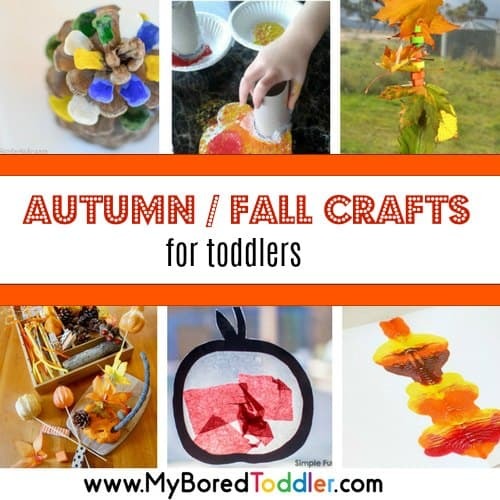 Artificial leaves – THESE ONES are great and you can use them for so many toddler activities! Toy rake and shovel – I really like this set but any that you have will work. 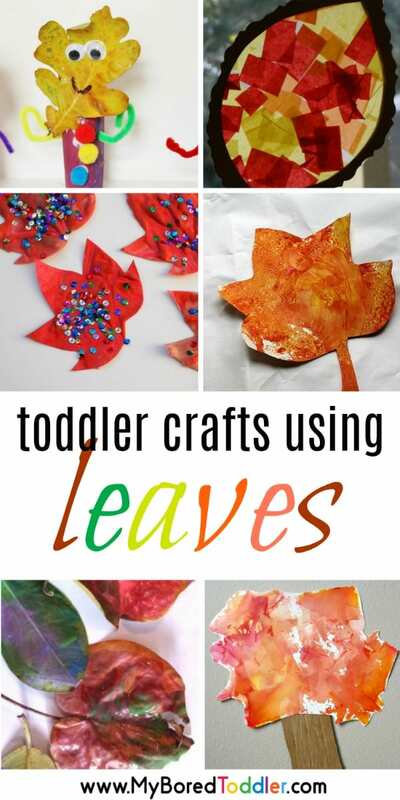 Use large leaves that are easy for your toddler to handle. The sandbox bin doesn’t have to be very big, just large enough to accommodate a couple inches depth of sand and some toys or digging tools. Choose a bin that can be carried outside for outdoor play when weather allows. Provide just a few toys at a time so your toddler is not overwhelmed. 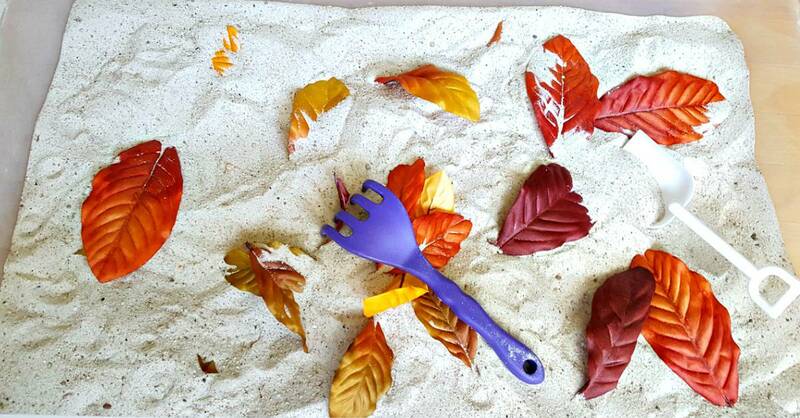 Your toddler will want to experiment with the leaves and sand tools right away. Allow some time for him to engage with the materials in his or her own way, putting the emphasis on making this a child-led activity. 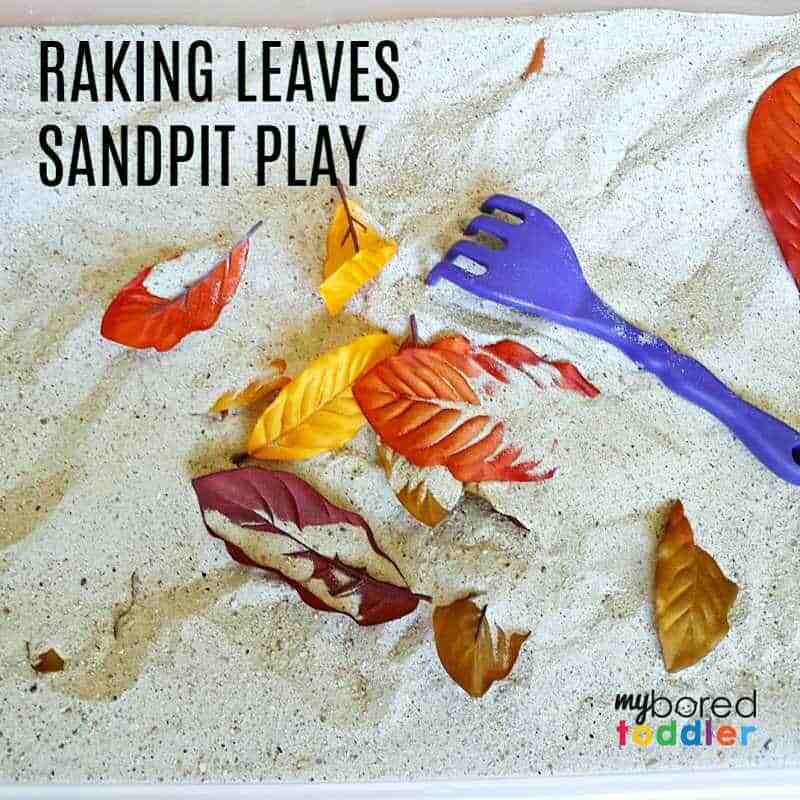 Guide your toddler through the motions of raking and digging, promoting fine motor skills as he plays. Rake leaves into a pile. Bury the leaves with the shovel, then dig them up again. Practice language and cognitive skills by engaging your toddler in simple learning activities. Count and sort the leaves, name the colors, or arrange leaves in order from smallest to biggest. Can you rake the red leaves into a pile? Let’s count the yellow leaves. Here is the largest leaf. Can you find the smallest leaf? 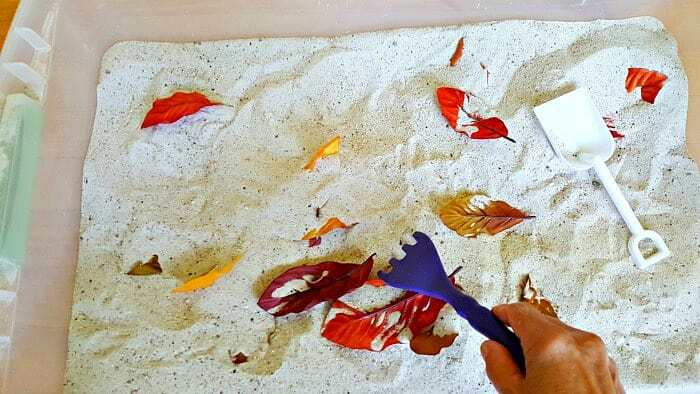 A sandbox activity is easy to set up and can easily become part of your daily routine. Spread a sheet or plastic liner on the floor under the bin to contain the overflow. This helps with easy cleanup. Providing different learning opportunities helps build gross motor and fine motor skills, as well as cognitive skills. Kids learn by becoming aware of their surroundings using all their senses, making a sensory bin a welcome tool.